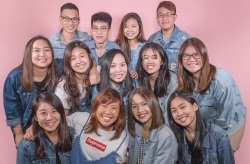 Ask your friends for their first impression of Bugis food spots and you will hear answers of aesthetic cafes and atas restaurants. Stalls like Supreme Pork Chop Rice, which sell affordably-priced dishes are incredibly difficult to find. 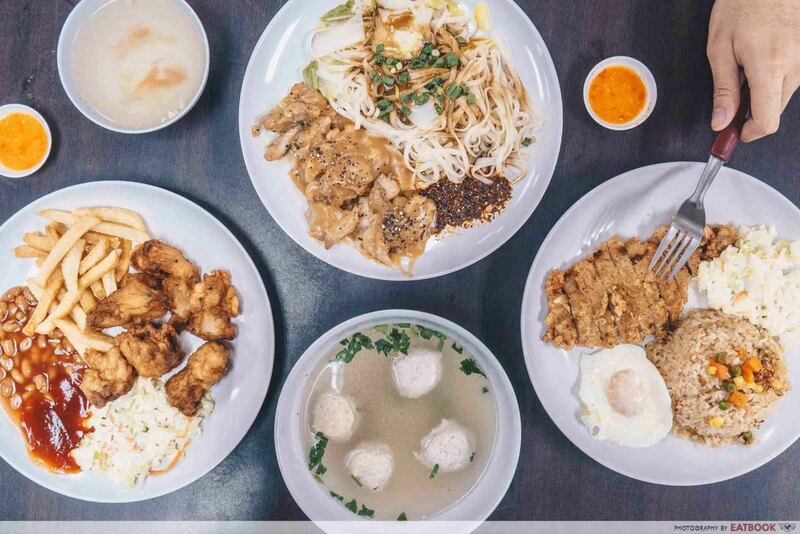 Cooking up crispy pork chops and comforting Taiwanese fare for under $5, this stall is an oasis for those dining on a budget in Bugis. With the supersized words “Supreme Pork Chop Rice” emblazoned on its storefront, we understandably had raised expectations for their Pork Chop Fried Rice ($5). 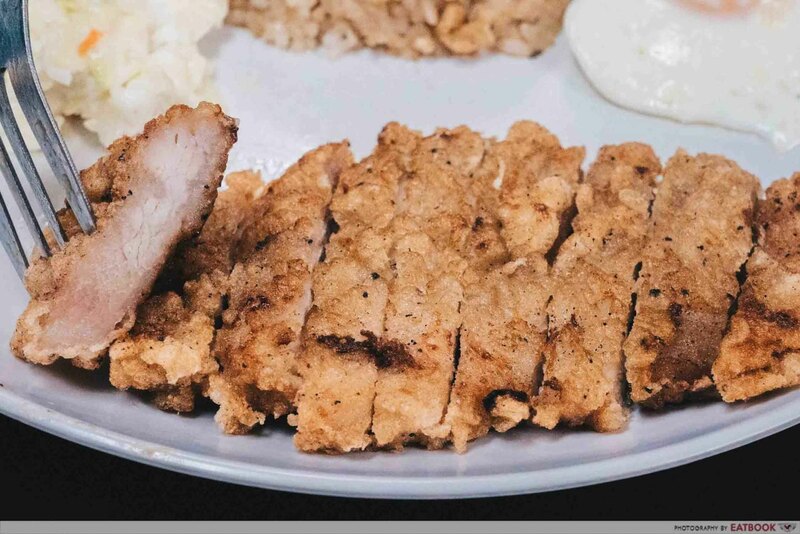 I was impressed as their peanut-brown pork cutlets were fried upon order, rather than being chosen from a molehill of ready-to-serve cutlets. Service too was commendable. 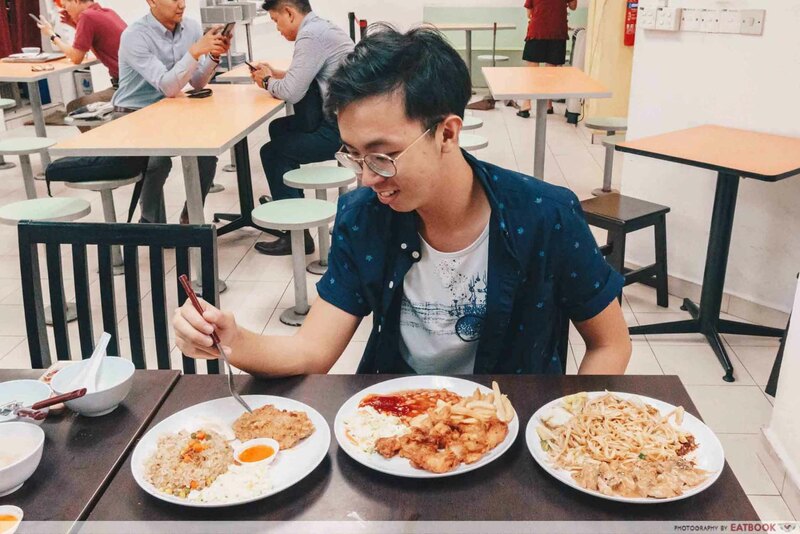 They were efficient and we speedily received our plate of sliced pork cutlets, dished up alongside a sunny side up, coleslaw, and a substantial portion of fried rice. 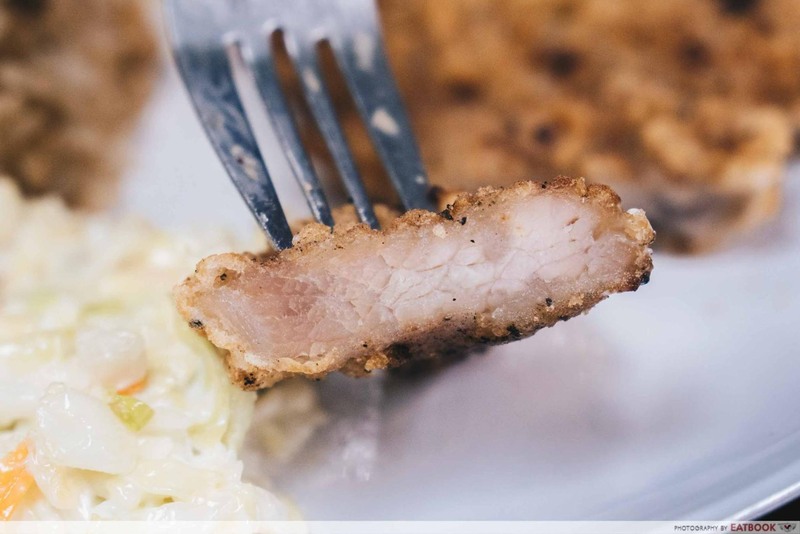 It was a case of love at first bite with their thinly battered pork chops. The meat effused a pleasant cinnamon aroma, suggesting a light seasoning of five-spice powder. Flavour-wise, it tasted exactly like the ones you would discover while wandering Shilin Night Market. What I adore most about their pork chops is the bold sweetness and accents of garlic that flavoured the pork. 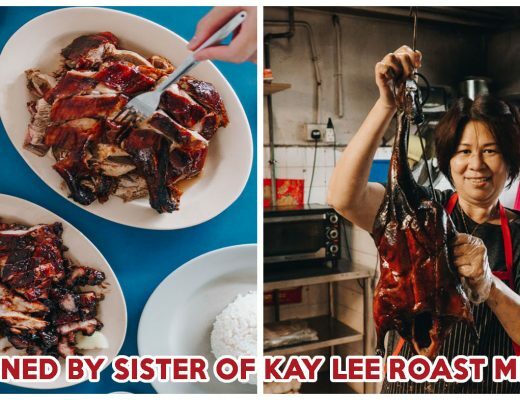 Should you closely inspect the meat, you would also notice black particles speckling its surface, explaining the light peppery aftertaste which laced every bite. 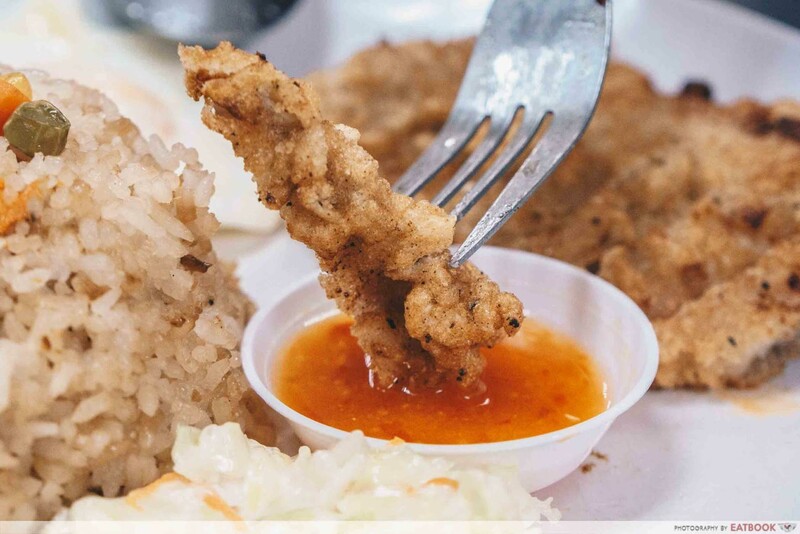 A chilli relish, similar to the ones provided with chicken rice, is available if you desire more moisture for your pork cutlet. However, I preferred to savour the pork chop as is, since the tartness of the relish clashed with the meat’s distinctive taste. The meat’s excellent batter capped off the stellar protein. The starch-rich mixture encased the meat in a fragile crust and helped retain the juiciness of the pork. The result is a refreshing contrast in texture, as the crackle of the crust matched against the succulence of the meat. Against the towering standards set by their pork chop, the fried rice disappointed with its dry texture and lacklustre aroma. The rice tasted somewhat flavourless albeit with whiffs of garlic and onion. The assortment of frozen vegetables buried inside the rice injected crunch rather than flavour to the rice. 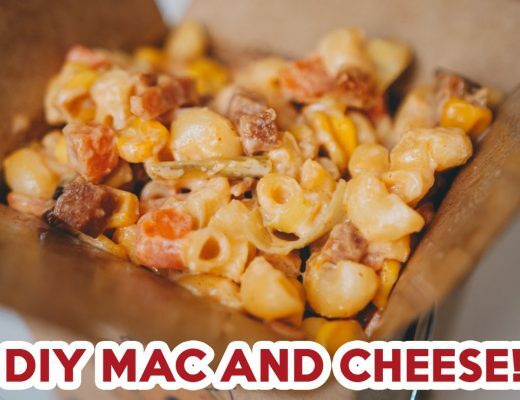 As for the helping of coleslaw that supplemented the fried rice, it was noticeably less saccharine than those offered by other eateries, hinting a minimal addition of sugar. As the cabbage was shredded and subsequently diced, the slaw was crisper than most slaws I’ve tried. Just like a stranger you bumped into in a crowd, the coleslaw was fairly forgettable. I would recommend substituting it for their pickled mustard greens instead. The latter is popular with regulars and piques your appetite with its sweet and zesty zing. 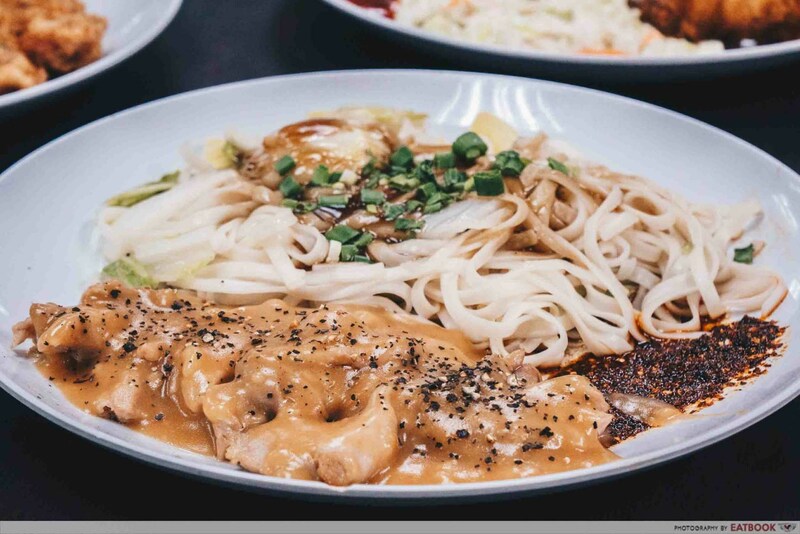 If the previous dish was the tale of a mouthwatering main and disappointing side, the Chicken Chop Noodle ($4.50) offered an entirely different narrative. Although the chicken was well-grilled, the juices released by the grilling process were blanketed by a copious amount of mushroom sauce. As the savoury sauce dominated my taste buds, I could scarcely taste the garnish of black pepper. 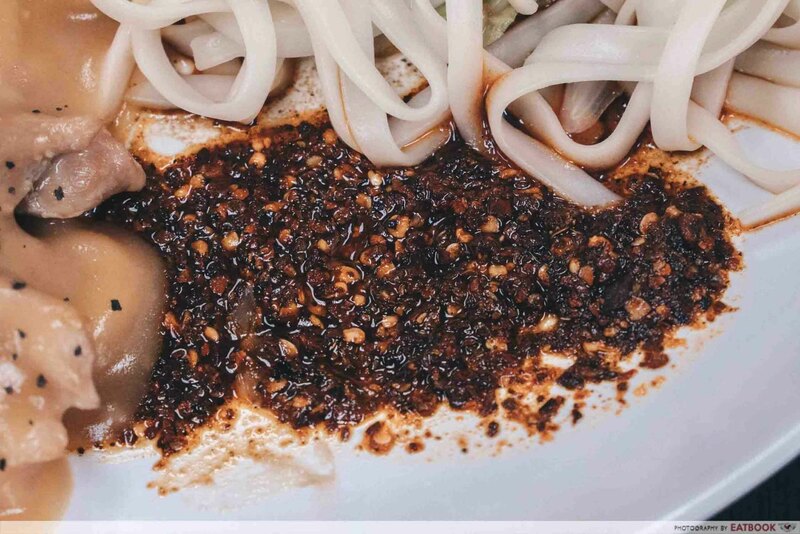 The saving grace was the flat-shaped noodles, which were served with blanched wong bok and drenched in a thick brown gravy. 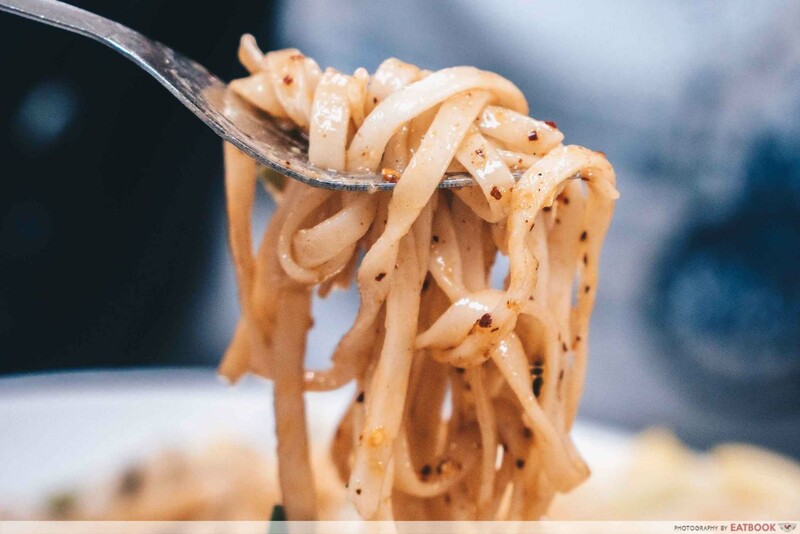 Though the noodles’ appearance resembled ban mian, the texture was surprisingly similar to linguine. These noodles were incomplete without mixing the chilli flakes served on the side. Don’t be intimidated by the menacing appearance of the chilli! It was pleasing on the tongue, injecting a light piquancy and supplied the noodles with a comprehensive tang. 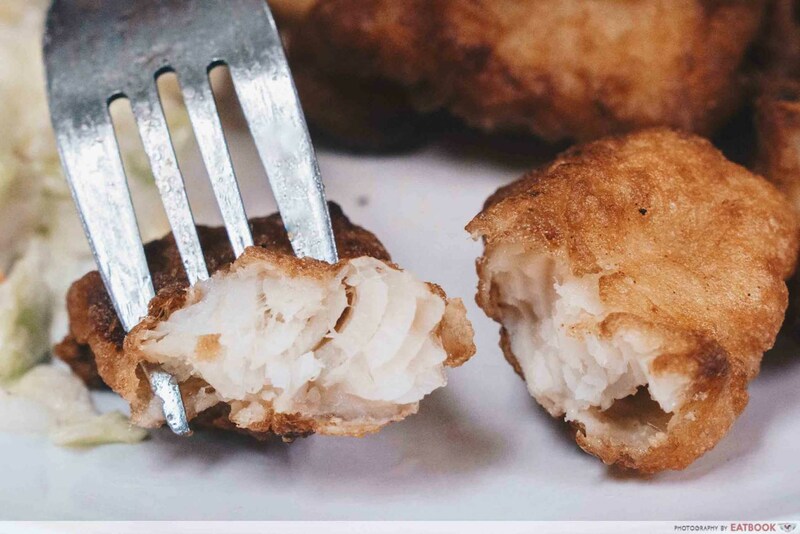 Fish w Chips ($4.50) seems to be a misnomer, as fish nuggets instead of a typical fillet were used. 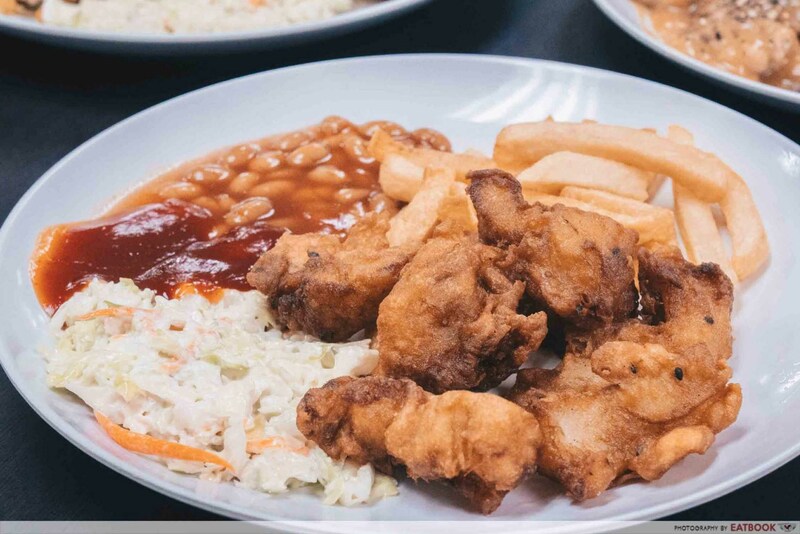 The dish thrilled me with its large portions, as medium-sized chunks of dory were flanked by baked beans, lightly-salted fries, and coleslaw. Interestingly, the batter included sesame seeds in the mix. As the crust shattered like a china vase upon contact with my teeth, it unfolded with a nutty sweetness from the sesame seeds. I also enjoyed that the thin crust of the fish was well-drained of oil. I wasn’t bloated as I munched down mouthful after mouthful of fish. Remarkably, I barely noticed the absence of tartar sauce, which I usually require to mitigate the unctuousness of the fried fish. Encouraged by the popularity of its Taiwanese-centric menu, the chefs recently introduced Gong Wan Soup ($4) and other authentic Taiwanese sides as well. 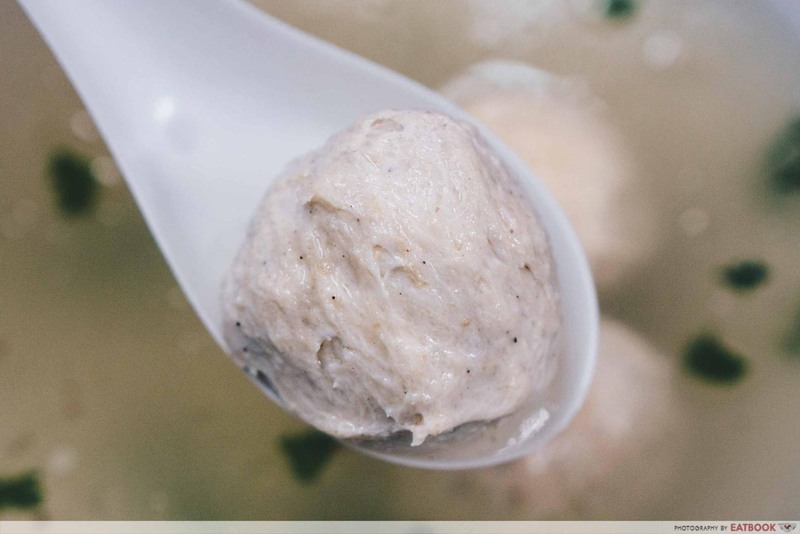 Indigenous to and rarely found outside of Taiwan, gong wan are challenging meatballs to prepare — the owners spent a full year tinkering the recipe to perfect their consistency. 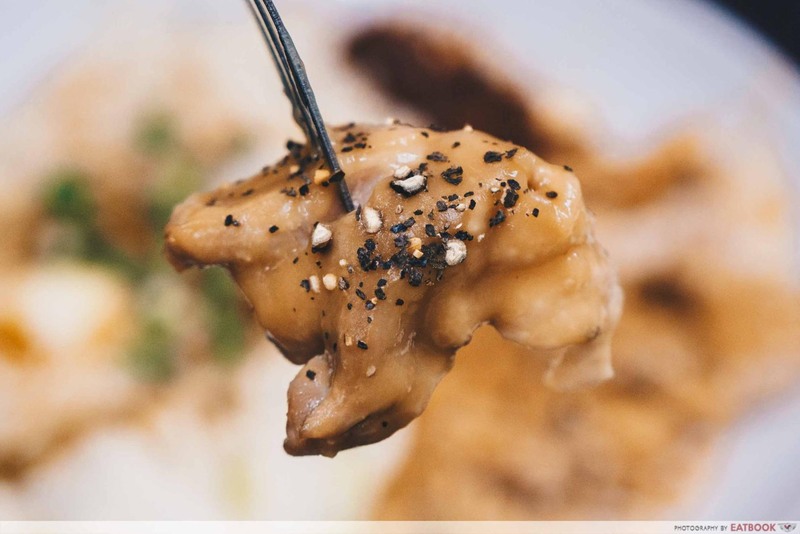 Their hard work invested was justly rewarded, as their meatballs perfectly replicated the unique bounciness of Taiwan’s gong wan. Brimming with minced meat, every mouthful allowed me to fully appreciate the porkiness and succulence of the minced meat. 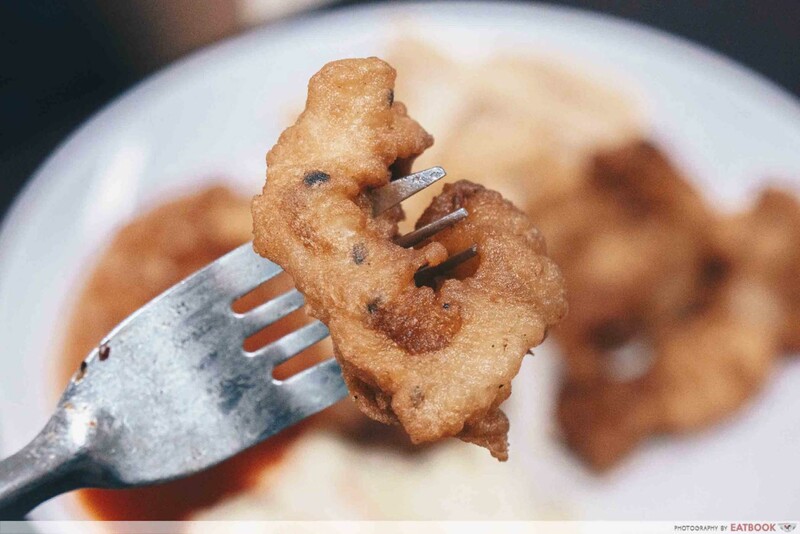 Their meatballs were also much larger than those found in Taiwan and required at least four to five bites to demolish. 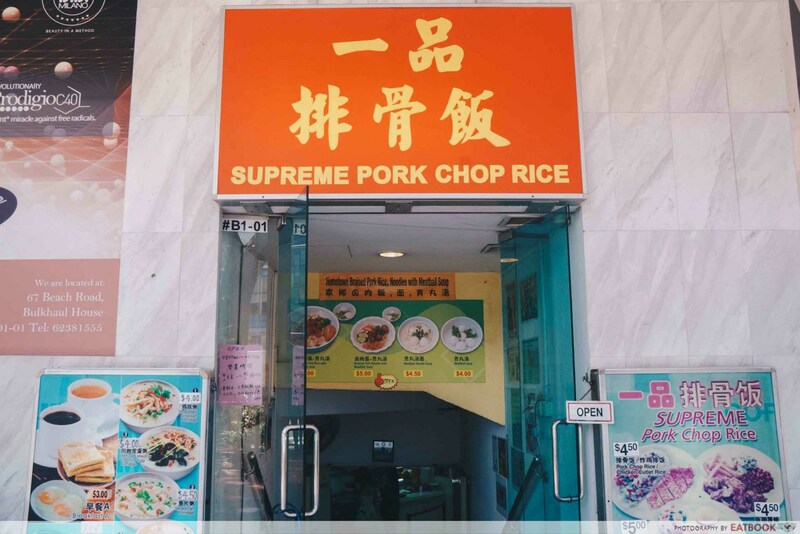 A convenient five-minute walk away from Bugis MRT Station, Supreme Pork Chop Rice is a store difficult to miss with its flamboyant storefront. However, as it is located in the basement of Bulkhaul House, the air can be rather stuffy. Thankfully, more air-coolers are going to be installed to improve ventilation, so eating here should be a more pleasant experience in the future. 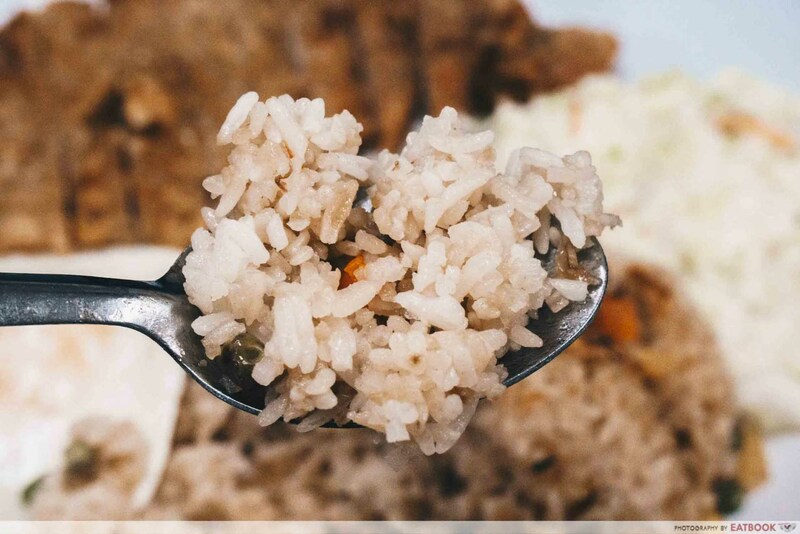 Supreme Pork Chop Rice has garnered a faithful following over the past two decades by following a proven formula of serving delicious food at bargain prices. The mains here are homely and I would love to recharge from an exhausting day by wolfing down their pork chops. 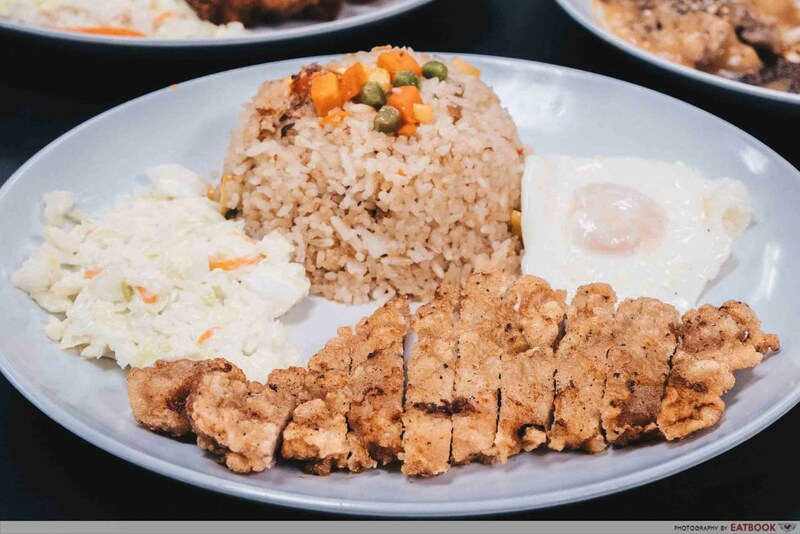 If you are around Bugis, make sure to visit Supreme Pork Chop Rice! 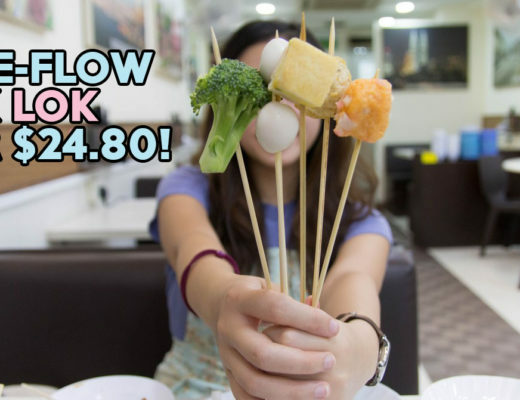 For more wallet-friendly options in Bugis, check out our food guide of Bugis hawker stalls for other cheap food below $5! Supreme Pork Chop Rice is not a halal eatery.